You know, what they say is true! Some of the best deals are after Black Friday, and this amazing deal is no exception! This last weekend was crazy, and after all the dust settled, our guys in the warehouse found all these great products way in the back. When we heard about some of them, we just had to get them out in the light of day. So here’s one that we thought would be perfect for all you road warriors, work at home types, and students alike! We’re talking about a sweet NEW 14″ laptop for you for just $329.99! How amazing is that? This puppy comes with a blazing 2.3GHz war horse processor, to hold all those holiday photos you know you are going to take, along with 3GB of memory, so it’s not lagging behind when you want to quickly save those updates to your Christmas shopping lists. With its fat 320GB hard drive, you have as much room as you wish you had after finishing four helpings of your Mom’s Thanksgiving Turkey Dinner! After all, you can never have enough space for all those Digital Copies of your favorite movies, downloaded music, and embarrassing family photos. And with its stunning 14 inch, better than 720p HiDef display, it the perfect movie machine on the go. Want the nuts and bolts? It is powered by an Intel Pentium Dual-Core T4500 2.30GHz processor to get things done super quickly. With its 14-inch HD Widescreen WXGA High-Brightness display, enjoy high-quality graphics thanks to the Intel� Graphics Media Accelerator 4500MHD. Stay connected with your friends and family this holiday with the 0.3 integrated webcam and 802.11b/g/n wireless networking. The eMachines eMD728-4838 LX.ND002.001 Notebook PC also features a 2-in-1 media reader to easily transfer multimedia from your Digital Camera or Camcorder. Get a truly Happy Holiday experience with the eMachines eMD728-4838 LX.ND002.001 Notebook PC. Now here’s the scoop, at just $329.99 for a brand new laptop (just 3 weeks before Christmas) it’s not going to last long. Heck, it’ll probably be gone this week. So, click the link below. Take a look at this truly great laptop value for the home, office, or school. If you decide you like it, I recommend you hurry. These $329 laptops will be a Christmas memory real soon. Those arrested on $5,000 bail. Officers wearing bio-hazard suites. Concerned about health, due to virus and infections. What did it cost to evict the protestors? Probably hundreds of thousands of dollars. Some protestors are on a corner now waiting and vowing to occupy another park and possibly the park at City Hall. Another group at a church nearby. Some believe it and some not but dreams do shape our lives. Just think if we can interpret the dream and analyze its hidden meaning, we will understand it is reflecting our facets of our life which we have deeply kept it hidden from the outer world. By interpreting our dreams, we can face all our problems without too much burden or worry. This is what Silva believes in? She helps people to enhance the power of dreams, which can solve all the worries and problems of your life, and that too with Silva’s dream control technique. It states your brain is always working while you are sleeping-you are in fact thinking about your past, future, and every day problems. In fact your whole day activities and thoughts are deeply ingrained into both the hemispheres of your brain, and what we get are the haphazard answers. If we are able to interpret these answers, we will be able to lease the thoughts of our imagination to resolve all our problems. This is the way scientists and artists’ brains works? Instead of following the logic, they move beyond the unseen while awake or asleep. In logic thinking, you move from A to B but through imagination you can get anywhere. Silva’s method can entail you to have actual interpretation of your dreams most accurately and helps you to solve all your problems. As and as you learn to analyze your dream, you will notice symbolism which in some form or the other is associated with your daily life. This will help you to have understanding of anything happening in your life and in fact you can control your dreams too. So why not use Silva method, understand what our dreams are saying to us and have a deep meaning to our lives. Are you searching the internet for solutions to view and edit Adobe Acrobat PDF forms on your iOS device, like the iPhone and iPad? Well there are a few solutions worth noting. 1. Lifeforms – does exactly what you want. You can fill out a form, print, email it or save it. Sign the form, add notes, draw or handwrite notes. It also saves every word you enter in a word list to use on the next form. It is a great app. 2. Note Taker HD app does the trick. Great app to fill-out pdf’s, get signatures on forms, etc. I am a Financial Planner and have my clients sign docs via Note Taker HD on my iPad. 5. FORM TOOLS PDF – Will let you add text boxes, check boxes, images, and draw free hand on a PDF. However, it’s greatest feature is the ability to create a form that can be filled out over and over again. Look for it in the app store. a must have if you want to work with PDF’s on the iPad. 6. Goodreader – to do this all the time. Works great. I think Goodreader is the best app in the App store. Goodreader, allows you to annotate your PDFs. The other is Forms Tools. This allows you to create a template over an existing PDF and create field. If it had pull down box or radio button optins, it would be better, but so far seems to be the best. 7. DocAS Lite (free version) – allows you to annotate, type within the PDF form to fill it out, record a speaker note and play it back, slide pannel to rest your palm; add notes like post or sticky note to the document. I find it basic but cool and most of all free! I don’t need to print a form just filled in the required info, signed and send it back to the requestor. Save trees! Summary: Of all the apps that are available, which one will work for you depends on your needs. Steven McAuley’s father has been in the label business for about 30 years and has shared a lot of knowledge with me about the industry. He was working with him in Texas for a few years, then moved out to Seattle with his wife a few months back and has been starting everything from the ground up again. This message from Lot18, the premiere destination for top rated wines and other gourmet and travel related items. We admit it: We enjoyed offering our best-ever selection of values, high-quality cuvées and party pours over Thanksgiving weekend. And now that half the Lot18 staff is on a post-holiday cleanse (seriously), we decided that while we’re still agreeable, we should do something nice before we turn into Scrooges from all the carrot and beet juice. So now through Dec. 14, the final day to guarantee delivery before Christmas, Lot18 is offering $0 shipping on all products. Want one bottle of Barolo? $0 shipping. Need a case of Côtes du Rhône for a party? $0 shipping. Need a two-pack of Champagne just because? $0 shipping. Get your holiday shopping done now … and get a little something for yourself while this $0 shipping offer lasts. Only publicly visible blogs with custom domains will be considered for this program. If you are interested but don’t have a custom domain, you can quickly sign up for a custom domain for your blog(s) below. This form is only available to logged in WordPress.com users. Still looking for a good deal on a brand new iPad? The 16GB iPad 2 WiFi-only in white is currently selling for $449 on eBay– a $50 discount. The iPad comes with free shipping, and most US residents will not be required to pay sales tax. You can find the deal on eBay here, limited quantity available. ***The offer has now ended. Over 12700 views of the offer! Estimated sold about 4 per minute during the sale. Over 300 original paintings will be on display for your viewing enjoyment. Less tents at the camp on the steps of city hall. Hundreds of police officers in riot gear at midnight at 12:01am pushing protestors. Will there be a raid? Police are still on scene in large presence. Jose Perez is assesing the situation of the encampment. They will take it from there. When is the question? The police hope they don’t have to see a mass eviction. Rep. Barney Frank, D-Mass., will announce his retirement Monday at an afternoon press conference in Newton, Mass. The 16-term Representative, who was part of the banking reform law that passed Congress last year. Rumored to be ready for retirement last year. The OccupyLA movement is about to take a turn, we don’t know the outcome of the vacating orders, and wether protestors will go without incident. With 55 days of the occupation of the lawn at Los Angeles City Hall, city officials want to re-claim the park space back and restore it back to what it was before the occupy movement took it over and the city did nothing to interfere. Now the city is about to interfere. The Occupy movement will move but there is no confirmation on where it will be moving. Are you searching for charging stations in Pasadena, CA? If you have a LEAF or Volt there are several locations. You will be pleased to learn that there are at least four locations where you can charge. I have listed them in order of use and cost, first one is CalStart where you can charge for FREE. The only one in Pasadena that currently does not charge. Thank you CalStart. At the CalSTART on Chester, you have to drive behind the building and will find two Blinks and two Clipper Creek chargers. As well as a paddle charger and 120v outlets. It appears that they are get used, but that the Blink and Clipper Creeks at least on a Saturday night nobody was using them. To use the Clipper Creek, just open your port and plug in, and it starts to work, no charge, at least for now. To use the Blink, apparently you need a card. But it appears to work. Located between Colorado Blvd & Green St., 2 blocks west of Hill. Note: Not sure what restrictions there are for parking here during business hours or off hours, but there are plenty of signs about towing. Lot 1 – East Side of lot, drive into the lot off Hill and enter the lot and look to the right along the campus side. You will see 2 Chargepointe chargers Level 2. Note: Not sure if you can park here without paying for parking or if parking is included. Note: will drive by this charger again and see if it is now working. The School House parking lot has 3 legacy charging units but also has two double NEMA 5-20, 120v outlets (one pair on a timer). There are two EV parking spots there. You need to go two levels down then back up to the first level to get to them (Northwest corner). First 90 minutes parking is free, after that $2 per hour with a $6 maximum. Late night entry is a flat fee. EVSE in the One Colorado parking structure on floor B2, east end (AVCON). There is one ChargePoint J1772 EVSE in each of the 2 underground garages located at an apartment (condo) complex. Does not seem to be a fee to park. Posted fee for using the EVSEs is $3/hour. They are operated by Carcharging Inc.
1) Enter on West side of De Lacey Street just North of Del Mar. Turn right at bottom of the ramp. Continue to the right. 2) Enter on South side of Valley Street mid block (between De Lacey & South Pasadena Ave). Turn left at the bottom of the ramp then right to the far corner. We are sure there will be more coming in the months ahead. Update: Sign on Pasadena window says – First Service Sunday Dec 4th 11am. We also hear that there could be a soft opening on Tuesday Nov 29, 2011. 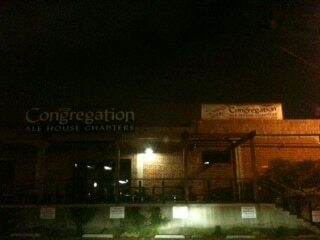 Congregation Ale House Pasadena Coming Soon. Here’s a picture taken recently. More details coming this Friday. We will not reveal the hosting company that is doing this amazing offer, but you will not want to miss out. For one weekend only, get reseller hosting at a never-before-seen, rock-bottom price: 99 cents for an entire year!!!! Amazing Black Friday and Cyber Monday promotion will run from 12:00AM PST (USA Time) on Friday, 11/25/2011, to 11:59PM PST (USA Time) on Monday, 11/28/2011. as well many other features. CoolHandle reseller customers also get access to premium features such as CloudFlare 1-Click CDN services, SSH access, free ENOM registrar accounts, and a 30-day money-back guarantee. Link will appear starting Friday November 25, 2011. Get Started Now With Coolhandle. GM Chevy VOLT Batteries Catching Fire? We are learning of an investigation into Chevy VOLT batteries catching fire. The investigation is ongoing, and we should be learning more as things develop. 11% less business for small businesses as larger business start to take over the space of smaller businesses. Sponsored by American Express, in the second year. According to the Small Business Saturday Consumer Spend Survey 2011, 61% of consumers plan to shop at locally-owned clothing and accessories stores on November 26. Are you one of them? What will you buy on Small Business Saturday? You can take part by shopping with our local small businesses on Saturday, November 26th. Looking for a place to eat? Try one of our many local restaurants. If you need a list of local stores, restaurants and services, you can find it here. American Express wants to help you make a difference. Get a one-time $25 statement credit when you register an eligible American Express® Card and use that Card for a purchase of $25 or more at a small business on November 26th. Apparently the players and the NBA have come to an agreement to end the lockout. At games will resume on Dec 25, 2011. There are other matters that need to be worked out like drug testing of players, and the fact that the players are on strike and have started play in other countries with national teams. Last night around 3am I could hear the screeching tires of what sounded like a truck or car, but this went on for at least 10-15 minutes. It sounded like it was less than a mile away. But this hasn’t been the first time I’ve heard this. Drivers in Pasadena need to slow down and the police need to be more vigilant about stopping this sort of nonsense behavior from drivers. It was most likely someone who had too much to drink and thought they would show off their “skills”.